I was given a copy of Affective Jacob's Ladder Reading Comprehension Program Grades 4-5 through the LibraryThing Early Reviewers. This was my first exposure to this particular reading curriculum which was developed by the Center for Gifted Education at the College of William and Mary. There are many grade ranges in the series, but this book appears to be the first that aims to broaden a student’s affective/social-emotional intelligence whilst also increasing reading comprehension (as appears the sole target of other books in the series). As full disclosure warrants, I must mention that my scholarly experiences do not lean toward the gifted/talented student; I have MUCH more experiences with struggling comprehenders. However, I must argue that many of the strategies employed by teachers of such labelled students are good strategies for ALL students, and I found that to be the case with this curriculum. This is a very mixed review. I liked the curriculum, found it to be a useful tool, but there always seemed to be a qualifier as I was writing what I liked about it. I particularly liked that the authors used a variety of genres and mediums, as well as mixing classic tales with modern interest pieces. HOWEVER, I think students could also enjoy a little cross-analyzation of how those writings and mediums differ yet all seek to do similar things (perhaps I missed this in the book, but I saw mostly that each ‘lesson’ was tied to only one particular story). I am also excited, in today’s test-driven world to see ANYTHING written with social-emotional growth in mind. Call me an old-fuddy-duddy, but I think we better get back to making schools more than utilitarian factories, churning out robotic test-takers. HOWEVER, I also think that many of the prompts/lessons could be stretched a bit further even (and probably will be by many a teacher). Public school teachers make up the largest group, by far, of humans educating the future citizenry. And while I am located and have only taught in test-insane Florida, I am also aware that most public schools in the entire United States are tied to a standardized test, measuring specific standards (oh, the horror stories to be told there). This curriculum 100% covers many, if not all, of the CCSS. YET, the teachers I know are required to list those in their lesson plans. Therefore, they would have to sit with each lesson and decide which of the CCSS each lesson taught/practiced/assessed, etc…. This doesn’t seem like such a big deal until you consider that the teacher probably has 3-5 different lessons going in just English-Language Arts alone. Start adding that up and you can see why having the authors make a simple footnote of standards aimed at each lesson would be so helpful (instead wasting paper on a blanket appendix of standards that every public-school teacher in the country knows like the back of their hand). Lastly, I’m going to get on a high horse. I was a remedial reading teacher and a remedial reading coach. These lessons would have been fabulous with my students too! Why must we always label things? I raised two “gifted” kids and one “average” kid. My “average’ kid is a doctor. Again, it’s my soapbox and probably doesn’t have anything to do with the merits of this curriculum.……. I think this is a worthy school/teacher purchase. I just wouldn’t delegate it to the “talented” few. 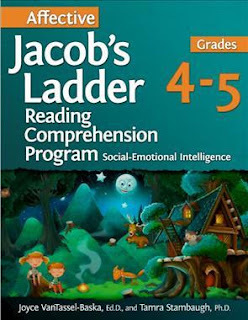 And here is the publisher's synopsis: "The Affective Jacob's Ladder Reading Comprehension Program uses a model approach to scaffold student learning and promote inquiry-based discussions of texts. This series of Jacob's Ladder focuses specifically on supporting advanced students' social-emotional needs through the discussion of reading selections in the following genres: short stories and media, poetry, and speeches, essays, and biographies. Using the same critical thinking ladder framework, students move from lower to higher level skills of self-awareness, metacognition, and goal setting. The books include high-interest readings, poems, and connections to videos and songs that integrate reading comprehension and analysis skills with affective and social-emotional needs, as students are asked to apply themes, character or real-life experiences, and lessons from texts to their own lives. New ladders were specially designed for this series and derived from relevant theories about empathy, risk and resilience, achievement motivation, and mindsets and practices for cultivating talent. The Affective Jacob's Ladder guides provide teachers with an explanation of the nature and substance of the theoretical constructs for each ladder. Also included are an overview of the goals and objectives of each ladder and suggestions for how to implement the ladders in the classroom in a way that supports students' academic and social-emotional needs at the same time."